Shawn’s favorite dessert is chocolate pie. He occasionally gets it at Jim’s as a treat, and his mom makes it when we visit for Sunday dinner. I asked her for the recipe. 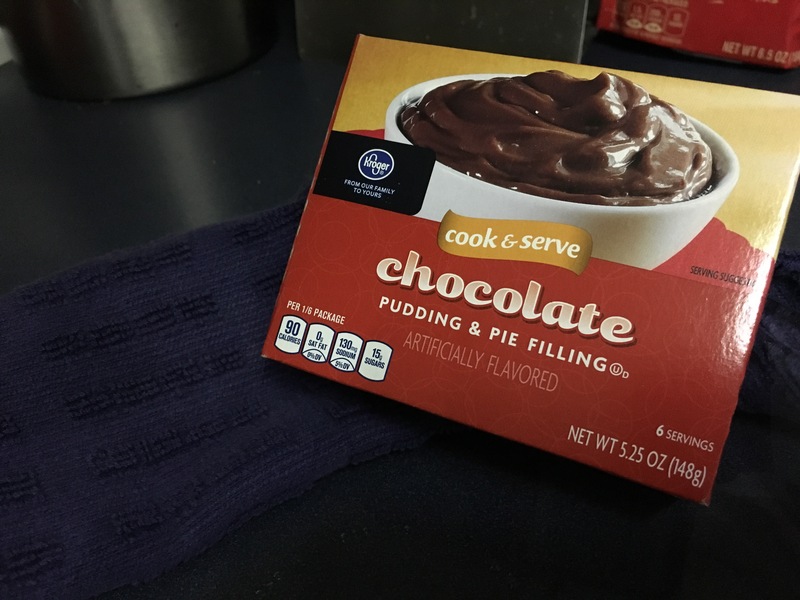 She told me about the pie crust, and about the whipped topping, but made sure I knew to get Cook and Serve chocolate pudding and not instant. I was surprised there even was another kind of pudding aside from instant. Why wait so long on something that can happen right now? “The fundamental difference between cooked and instant pudding is the preparation. With cooked pudding, you must apply heat to the mixture on a stovetop. It must be brought to a boil, with constant stirring along the way, then cooled to set. This takes time…and energy. If you like hot pudding, great. If you don’t, be prepared to wait about 2 and a half hours. Turns out, all the work and waiting is worth it. And the Israelites- waiting for the Messiah. All the years, since the Garden of Eden, waiting for things to be made right, and generation after generation, they waited. Until one night, some shepherds were doing their thing, and Tada! They got a VIP invitation to visit the Savior of the World. He is here. Emmanuel. All the waiting- worth every second. And we wait now- we wait for Him to come back. We hear the scariness of the world and long for all things to be made right. And we pray for it to happen today. We want to see Him worshipped by all. But we wait. We wait on our healing, wait for that restored relationship, we wait for direction. And it seems like it just might never happen. And then, Tada! It doesn’t always look like how we thought it would, but it’s perfect. If you’re in the middle of waiting on something, don’t give up. It’s worth it. We have a God who knows that what we need is something richer and more complex. Something that isn’t limp or watery. Some substantial transformation. The real deal. He won’t cheapen it to save some time. Trust Him, and hang on, dear friend.